Banfield Retreat est un véritable retraite en bord de mer. La conception tropicale ouverte vous détend immédiatement dès que vous entrez. Vous pouvez même vous prélasser au lit et profiter de la vue. Les brises de mer douce sont capturées dans toute la maison par l'intermédiaire de persiennes et portes de verre coulissantes. Pour ces nuits chaudes que nous avons sous les tropiques la maison est entièrement climatisé et pour les quelques nuits fraîches de l'air conditionné est réversible. La cuisine ouverte est bien équipé ou si vous souhaitez simplement vous détendre sur la véranda et profiter de repas en plein air, il ya un barbecue fabuleux pour la cuisson du poisson-vous pris ce jour-là ou un bon steak. Pourquoi ne pas sauter et vous rafraîchir dans la piscine, pendant que vous attendez! Si le dîner de cuisson est pas votre ordre du jour, il est seulement une courte promenade à certains des restaurants et des restaurants populaires de Mission Beach. Wongaling Plage Shopping Village est d'environ 1/2 km. Banfields Retreat est un refuge idéal pour un couple ou une famille. Il dispose de 3 chambres reine de taille et 2 salles de bains. Toutes les chambres ont été soigneusement décorées et sont idéales pour que le sommeil heureux que nous souhaitons tous en vacances! Cette maison est un être considérés si vous cherchez un séjour relaxant sur la plage avec le soupçon de luxe. We enjoyed a very relaxing couple of nights at Banfield Retreat. Spacious and comfortable home with plunge pool, directly opposite beach. We will definitely return! Thankyou for your comments. If you do decide to come again, please let us know so we can look after next time. What can I say....this house is beautiful. If I could I would buy it. Perfect location, perfect set up, well stocked house. It even has beach towels to use. We will definitely be back. Air conditioning and fans everywhere. Stayed 2 nights, was very relaxing. The house is beautiful, beds are comfy, had everything we needed and plenty of room for all of us. Gas bottle ran out for bbq lunch, rang caretakers and the bought one down immediately, great service. We would definitely stay here again. So glad you enjoyed our house, we would love to see you again in future. We enjoyed our stay at Banfield Retreat because it was so close to the beach. Hi Diane, So pleased you enjoyed our house. We love to see you and your family again in the future. Kind regards, Anne and John. We enjoyed our short recent stay. House was functional and homely. Pool a little smaller than photos seemed but still enjoyed. Excellent location with superb view! 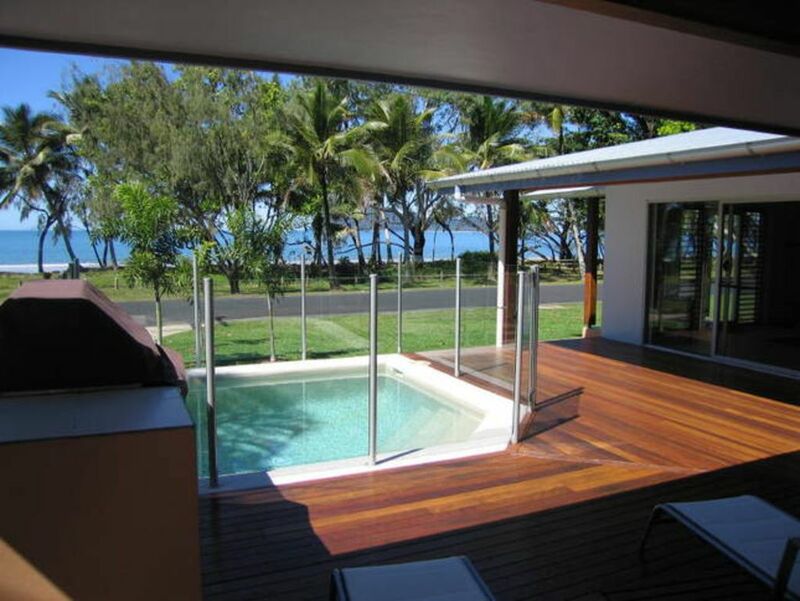 Beautiful, modern three double, two bathroom with plunge pool this house is just across the road from Wongaling Beach. With a large lounge, kitchen and separate dining room this house has front and rear decks. Could see the sea from the lounge, dining and main bedroom areas (and listen to the waves at night). Great beach for little kids with shallow wave area and wide easy walking foreshore. We found a kid's playground a few hundred metres to the right and a great fish and chip shop. Stinger nets access would need transport but in non stinger season swimming is just a stone's throw away. Hi Jan, It's always nice to get such nice comments about our house. We always try to make ones stay the best you can possibly have and we hope we ,any see you again in the future. Kind regards, Anne and John.